Facebook is Introducing Timeline feature for pages from 30 march. From Today 29 Feb 2012 Facebook has start showing time line feature for pages.You can get a preview option while login to your page. If you click on preview button than Facebook time line will be activated for your page permanently. After clicking on preview button you are asked to publish your page time line feature on Facebook. If you do that than the timeline feature of page will be visible to other users. One most interesting feature added by Facebook in its new timeline for page is the Admin panel. 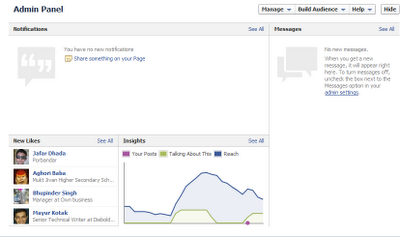 Through this panel admin can easily monitor his page. Its very helpful feature which is added by Facebook for page timeline user. So Just go to your Facebook fan page and start using timeline feature for your pages. Thanks for Reading Post. For more technical news updates,tips and tricks please subscribe to this blog.